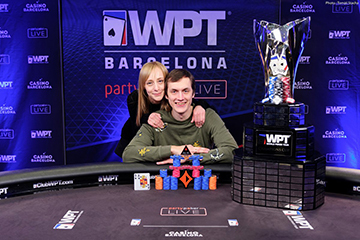 The €3,300 buy-in Main Event at Casino Barcelona accumulated a €3,570,570 prizepool after 1227 buy-ins at the Casino Barcelona, the flagship event closing a massive festival. A huge hand with four players left managed to get Zavorotnijs right back into the game and when he finally met Boris Kolev heads-up for the title it would take only 3 hands to decide the trophy’s owner. A rivered flush finished Bulgarian Kolev’s dreams and the Latvian victor celebrated his success with his wife, who herself had satellited into the Main Event.